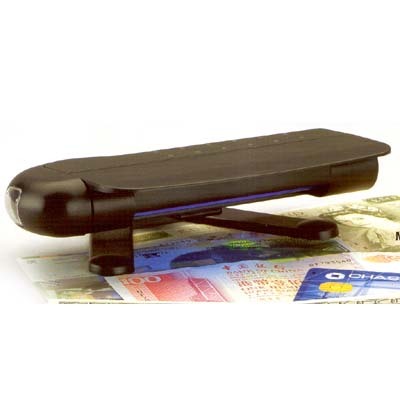 The device with built-in ultra-violet tube which decodes "invisible" security marks(fluorescent marks) on banknotes or stamps. With counterfeit bill, the UV light is diffused on the paper and reflects evenly towards the eyes.It also with built-in torch bulb served for searching purpose , etc. Application	: Mini size desktop model for shops, restaurants etc. with Counters of limited space.. Packing: Each piece in gift box; 48pcs./export carton. Meas: 51x42x39cm (0.08CBM). GW: 19KG.